I've become some kind of gold-obsessed magpie for all things bling, but unfortunately for skint little old me, I can't afford the real stuff. However, my penchant for junk jewellery is as strong as ever and being the bargain hunter that I am, I'm still getting my style fix with the shrapnel found in the bottom of my purse. I bought this great extra-long chain necklace the other day from my local Age Concern for only £1.50. 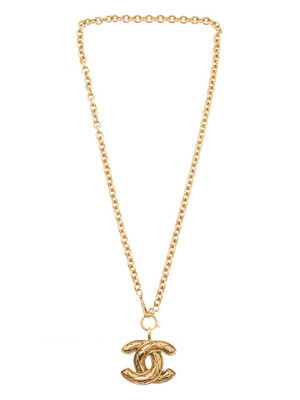 It's a double-chained necklace with one distinctive long-plated chain which gives it some extra character. I've been layering it with this other short rope style chain (pictured) which I picked up at a car boot sale last week. 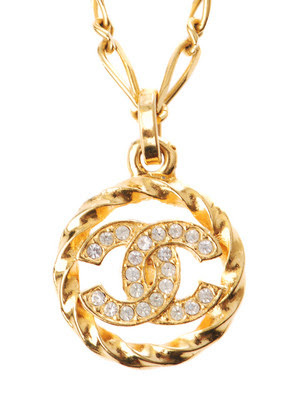 As much as I try though, I can't help but lust after the amazing vintage Chanel chains available out there. Awhile back, ASOS launched its 'Vintage Designer Jewellery' section- providing more than enough unattainable treasure to drool over (on my measly student budget anyway!). I recently came accross a few more of these Chanel chains on Matches whilst doing a bit of Windows shopping (see what I did there?!). I particularly like this classic, quilted 'double C' chain- but at £1095, it's just not happening is it? Diamantes, for me, usually conjure up images of gem-encrusted tat found on the sale rail at River Island, but if anyone can do them right it's Chanel. The second chain also reminded me of a necklace I bought at one of Birmingham's vintage fairs, so I was prompted to dig it out. In the process, I also found this great chunky gold bracelet from H&M- a piece of jewellery sure to quench my bling thirst! As I've mentioned, I'm also moving flat which means redecorating! I've been rooting though old draws and cupboards to find old bits of stuff which may get an airing at the new place. I just wanted to share this great old jewellery box I found which I was given as a child- perfect for cramming in all the jewels I've been buying! It did play a tune but the music box doesn't seem to wind up. The ballerina inside has also gone and disgraced herself by losing her tutu. But I reckon she now looks like a much cooler 50s pin-up girl in a gold bathing suit! What do you think? It will look great in my new room, which I anticipate to be decked out in creams and florals. I'll post some pictures once it's finished.